Little fish that clean parasites off bigger fish appear to recognize themselves in mirrors — passing a difficult test used to determine intelligence in animals. A species of tiny fish have passed a self-awareness test that's widely considered the gold standard of measuring intelligence in animals. Depending on who you ask, this either means fish are a lot smarter than we give them credit for — or we need a better test. 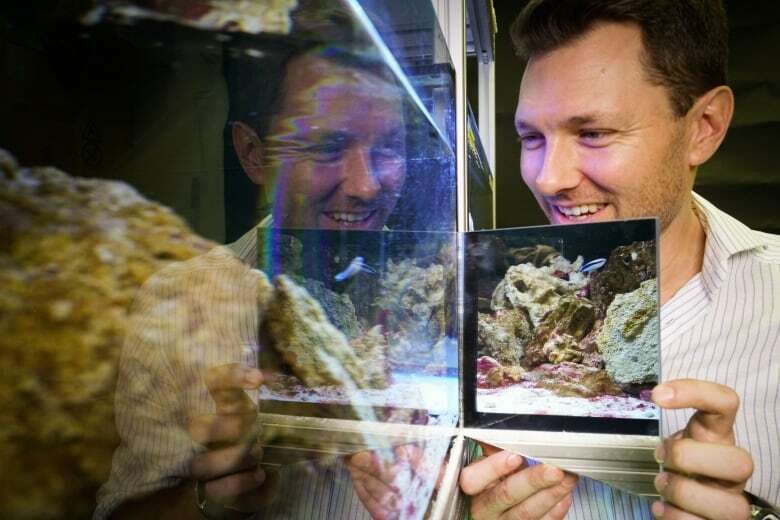 The study, published in the journal PLOS biology, shows cleaner wrasse — little fish that feed off the parasites on bigger fish — were able to pass the so-called "mirror test" and recognize their own reflections. Only a few very intelligent animals have ever passed the mirror test, including chimpanzees, apes, bottleneck dolphins and Asian elephants. "I acknowledge and enjoy, actually, that it's controversial," researcher Alex Jordan, professor of animal behaviour at the University of Konstanz in Germany, told As It Happens host Carol Off. "But I also think it's time that people accepted and understood that fish can show some incredible cognitive abilities that pretty much go underappreciated." The first step of the mirror test is simple — put the subject in front of a mirror and see happens. 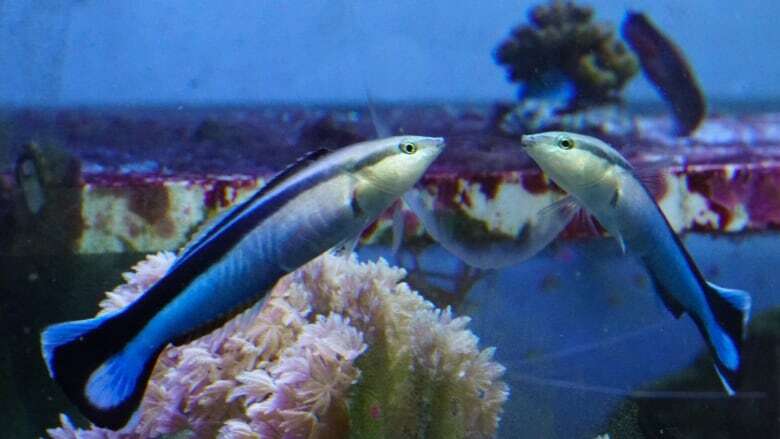 When the cleaner wrasse were first introduced to a tank with a mirror, they tried to attack their own reflections — a common reaction for less intelligent creatures. But they quickly learned better. After the first day, they were attacking much less often. Within a week, they pretty much stopped altogether. Then the fish started experimenting. "I don't know if you've ever kept fish, but if a fish is swimming upside down, that's typically a very bad sign for that fish," Jordan said. "But these cleaner wrasse would approach the mirror, swimming upside down as they did so, and then they would right themselves and swim back away and repeat this process." 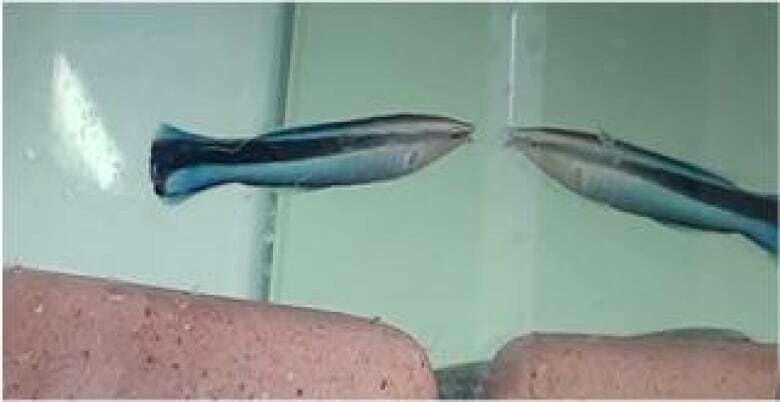 The researchers believe the fish were testing their reflections — like how chimpanzees makes faces in the mirror when they see their reflection for the first time. Once the fish had passed the exploration phase of the mirror test, it was time for the final step. Researchers put coloured marks on the fish's throats, where they wouldn't be able to see them. "Then the question is, do the animals attempt to remove the mark after having seen it in their reflection?" Jordan said. While fish can't reach up and try to wipe the mark away, like a person or an ape would do, they did the next best thing — diving down to the bottom of the tank and scraping their throats against the pebbles. "It indicates that they understand that the mirror is not something else," Jordan said. "It's not something beyond them. It's not a mirror into another world. But rather, it is reflecting the world that they are already in." Does this really prove the fish are as self-aware as chimpanzees? Some scientists say it's a stretch. Frans de Waal, an Emory University professor of primate behaviour professor, says the study proves the mirror test is an insufficient marker of self-awareness. In an editorial commissioned by PLOS, he said some animals may fail the test not because they're not smart enough — but because they simply don't care if they have a mark on their bodies, or they have short attention spans, or they don't see things the same way people do. That doesn't necessarily mean they lack self-awareness, he wrote. AS IT HAPPENS: Orcas float dead calf in apparent mourning ritual. Other animals can learn to pass it with the proper training. That doesn't necessarily mean they posses self-awareness, he said. "Shaped by thousands of rewarded trials, mirror responses are about as meaningful as would be the literary talent of a monkey taught to type 'to be or not to be,'" he said. Jordan says he agrees scientists need a test that can be applied across various species. "I don't think this is proof that fish have self-awareness," he said. "It's proof that they pass through the mark test, and that should make us critically re-evaluate, in all corners of the scientific community, what our understanding of the test is and what it's really showing." But Jordan also says scientists need to ditch their preconceptions about certain animals. When a dolphin or an elephant passes the mirror test, Jordan says we accept this as evidence of their superior intellect. But when a fish passes the test, there's backlash. "I think that has a lot to do with our inherent biases about sort of intuitive understanding of animal sentience and intelligence. We identify with cute furry animals. We identify with ones that have a visual system that's like ours, that have eyes that are like ours, that we think we can sort of empathize with," he said. "But it's not reasonable to reject that other animals aren't intelligent or couldn't have these capacities just because they are so different from us." Written by Sheena Goodyear. Interview with Alex Jordan produced by Richard Raycraft.